Things To Look For In A Reputable Crane Service Company - JETS TOWING INC. The usage of crane services dates back to several decades ago. In those days, cranes were used to construct huge monuments such as medieval churches and Egyptian pyramids. Nowadays, construction companies hire crane service while building a small or large building. Generally, cranes come with a hoist rope, sheaves, and wire chains, along with pulleys and levers to lift extremely heavy amounts of weight. There, choosing the right crane service company is crucial. While hunting for the reliable crane service company, go for the service that will be the backbone of your entire construction project. Besides this, you must hire crane services in New York that offer safety to you and your project. We, at Jets Towing, offer crane services with safety and assurance to complete your project within the time. Read further to know the things you must look for in a crane service company. Safety – As already mentioned, safety should be the top priority of every crane service company. Since construction and manufacturing world is associated with accidents and injuries, so companies should take precautions to keep everyone safe during the process. When it comes to safety, you must consider the construction and the maintenance record of the crane. As a thumb rule, you should hire a company that provides the certified and well-trained operator for the type of crane you’ve chosen. Experience – Another important factor you need to consider while hiring a crane service company is to ensure that it employs experienced professionals. Before you make any commitment, confirm the company you’re considering has years of experience in the field and has previously worked in a similar type of construction projects. The most important thing to look for in a crane service company that it also holds prominent experience in every kind of the situation in the past. Tools and equipment – While looking for the tools and equipment, make sure the crane service company has the latest model equipment, and it has a respectable reputation in the market. Plus, they must offer crane services at an affordable price, and it should be easily accessible. There are different types of crane services that you can hire to use for a different construction project. The crane service selection usually depends on the type of job and the place. The common types of crane service include mobile and tower cranes. However, these days, you can also hire cranes for offshore construction, and others are known as a telescopic, loader, and floor cranes. For instance, if the construction projects include a post, bridge, or offshore drilling platform, then you must hire the company that deals in floating crane service. This type of crane service is best for loading and unloading ships and other boats. On the other hand, if you require crane service just for loading and unloading materials at the site, a loader crane is the right option for you. If your construction project is short-term, or require crane service for rescue job, or need help in lifting boats in and out of the water, telescopic crane service is all you need. Lastly, floor cranes are usually smaller as compared to other cranes and are used when you have an inside job. These are some of the things you must consider while hiring crane services in New York. 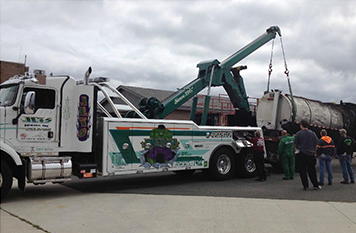 For information about crane services, contact us – Jets Towing Inc. We deal in various types of towing services, emergency roadside assistance, crane services and more.